The Obligate Scientist: Which Came First: The Chicken or the Egg? 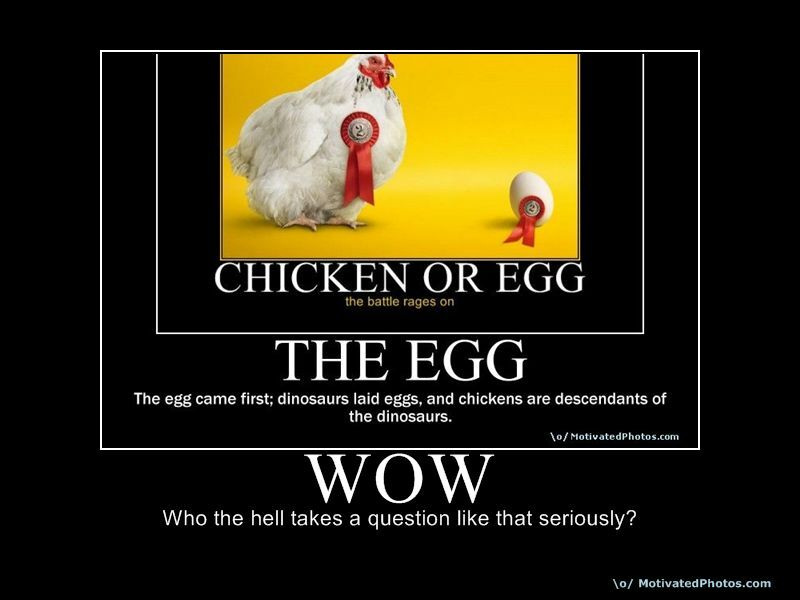 I was surprised to hear my local news anchor announce that scientists have "finally" answered the question of which came first: the chicken or the egg. The story is making rounds in the news - for example here, here, here, and here - but they're getting it wrong. Three words: Bad. Science. Journalism. Back to our question. Ignoring the original causality dilemma, didn't we clear this up a century or two ago? The egg came first (yes, even the shelled egg) and it arrived on the scene a couple hundred million years earlier, so it isn't even close! Despite the horrible news coverage, the real story behind the bad headline is interesting. In short, molecular modeling work suggests the role of a certain protein (ovocleidin-17) is to catalyze the deposition of calcium during the formation of the egg shell in chickens. This has been it's suspected role for a few years now, but it's great to have another line of evidence that also suggests this protein's function, plus it gives us a better understanding of how eggs are produced. The news story does has a silver lining. After covering it, my local Fox news anchors went on to mention that the authors of the research did point out that birds evolved from dinosaurs, and that perhaps we should rephrase the question in terms of dinosaurs versus dinosaur eggs. If you missed that, let me reiterate: my local Fox News anchors pointed out that birds evolved from dinosaurs! Given the results of a recent poll, that's a welcome statement on the evening news. In the United States, almost half of respondents (47%) believe that God created human beings in their present form within the last 10,000 years, while one-third (35%) think human beings evolved from less advanced life forms over millions of years. Half of people in the Midwest (49%) and the South (51%) agree with creationism, while those in the Northeast are more likely to side with evolution (43%). These are similar to previous polling results from Gallup on Evolution, Creationism and Intelligent Design. Yea this is where the rest of the world gets it's opinion about the united states. Not you in particular, but as a country, pick up a book and read. Not a story book but an educational one. Please.